Jack Sandweiss is Donner Professor of Physics at Yale University (1980-present). His research interests include high-energy and heavy-ion physics, in particluar, the new states of matter involving "high strangeness" which are made possible by the high energy heavy ion reactions which produce large numbers of the so-called strange particles. August 19, 1930Birth, Chicago (Ill.). 1952Obtained BS, University of California, Berkeley, Berkeley (Calif.). 1956Obtained PhD in Physics, University of California, Berkeley, Berkeley (Calif.). 1956 – 1957Physicist, Radiation Laboratory, University of California, Berkeley. 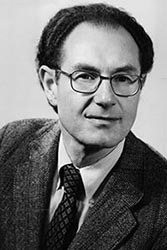 1957 – presentInstructor to Professor of Physics (1957-1980); Consultant, Laboratory for Marine Physics (1957-1960); Chair, Department of Physics (1977-1980); and Donner Professor of Physics (1980-present), Yale University, New Haven (Conn.). Advisor at University of California, Berkeley. Obtained BS (1952) and PhD (1956).